I got a lot of emails asking about how to dress for office/college events which have smart casuals as dress code. I thought it would be a great topic to blog about. Firstly, just because it is an important event it does not mean you have to rush to shop to buy clothes. 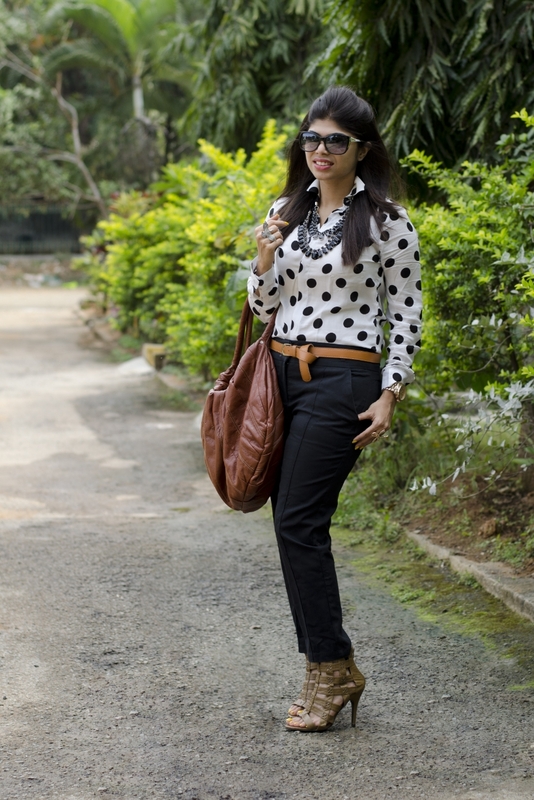 In this blogpost I deal how you can recycle a basic polka dot shirt into three different smart casual outfits. Smart Casual is a relatively new dress code that often bridges the gap between Casual and Business Casual. Smart Casual is a casual, yet polished, “smart” way of dressing that is practical in more relaxed environments where it is still desirable to look professional and put together. This is probably my favorite way to dress! (Although a pencil skirt is my favorite way to dress in the office). Choose tasteful attire when dressing for an office party with a smart casual dress code. If your office typically follows a business casual dress code, select an outfit that you would wear to work. Alter it a bit by adding in something sparkly or shiny, such as shirt, a blazer, a scarf or a statement piece of jewelry. This will allow you to look appropriately festive. In outfit one, I have paired polka dot shirt with black pencil skirt and blazer. Added a festive touch with funky statement jewelry in the form of cuff, necklace and rings. Completed the look with messenger bag. The best thing about this outfit is if you have to head to a meeting after the event then all you have to do is remove the necklace and cuff. In 30 secs you can transform it into a formal attire. Rings and Cuff - Stilettos Diary Shop. Smart casual does not mean that you can wear whatever you want, the smart casual dress code it has certain rules that you should consider. Do not interpret the word "casual", as most people have a big misconception about it. Smart casual clothing means you are wearing a well-ironed, neat and slick party code dress. If you are not fan of skirts, then you can opt for trousers. I opted for balloon trousers and paired it with polka dot top. Usually clutch bags and polished bags are considered smart casuals, but I decided to pair the outfit with hobo bag. Completed the look with tan cage heels (this is the only tan heels I have! ), belt and statement jewelry. This outfit can be worn to more relaxed environment like upscale restaurant, college events, get-together, dates, dinner parties. I suggest for office events replace the cage heels with pumps and remove few set of rings from this outfit. 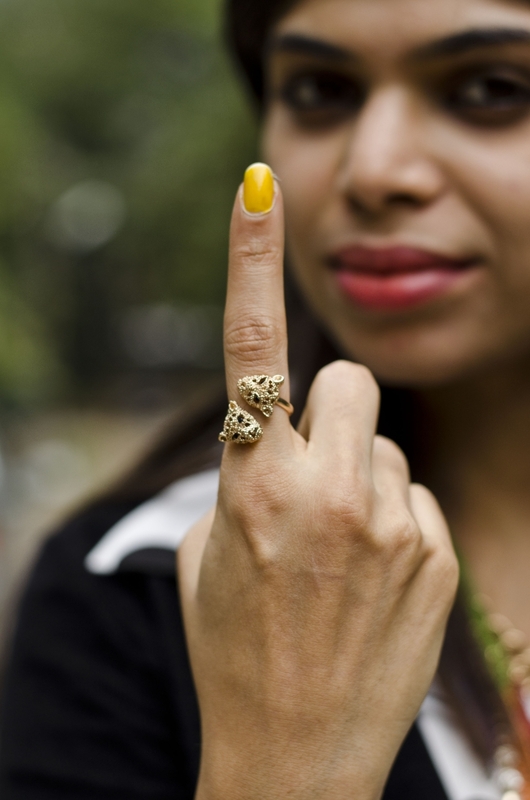 If you are not comfortable wearing a lot of jewelry, then I suggest opt for something similar to Outfit three. 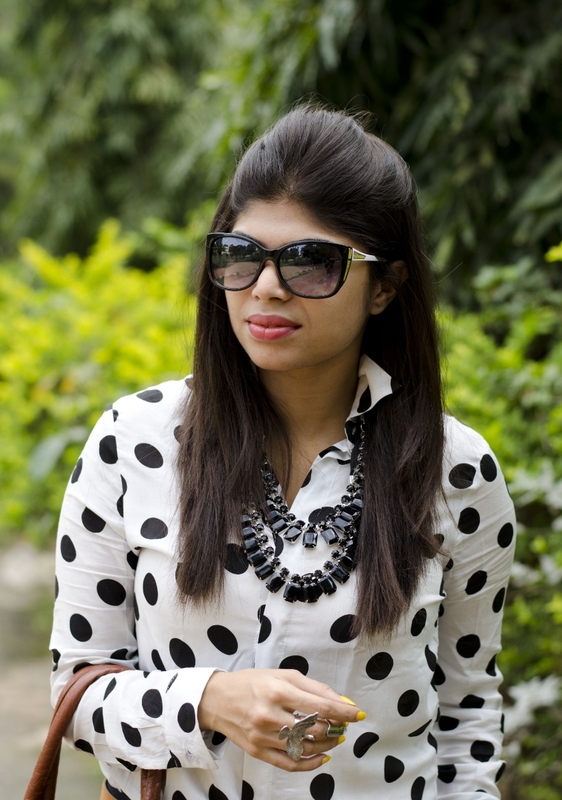 Paired polka dot shirt with pencil skirt without belt. This gives illusion you are wearing a dress. Mid length dress and skirts just above the knees are permissible. Anything less than 10cm above the knee is a definite no. Added a bit of color with a vibrant clutch and retro mint sunglasses. This outfit is perfect for office brunch party. If you are not high heels person, then you can opt for flats or wedge heels. - Flip Flops - T-shirt (Slogans or logos on the top are not allowed) - Large tote bag - Evening gown - Sportswear - Mini skirts, Sequined dress. Hope these outfit ideas helps. Photos thanks to Muralidhara Nidwannaya. I love the concept of daily digital outfit diary. Facebook is currently getting on to my nerves thanks to the "sponsored post feature". I will be more regular on Instagram account, so tune into @stilettosdiary for more outfit inspiration, sale deals, every day style tips and some candid moments. Very beautiful : style, photos, blog ! Just Wow !Love this look from head to toe..very wearable and smart! love the black! so gorg! xO! I love your shirt! So chic! 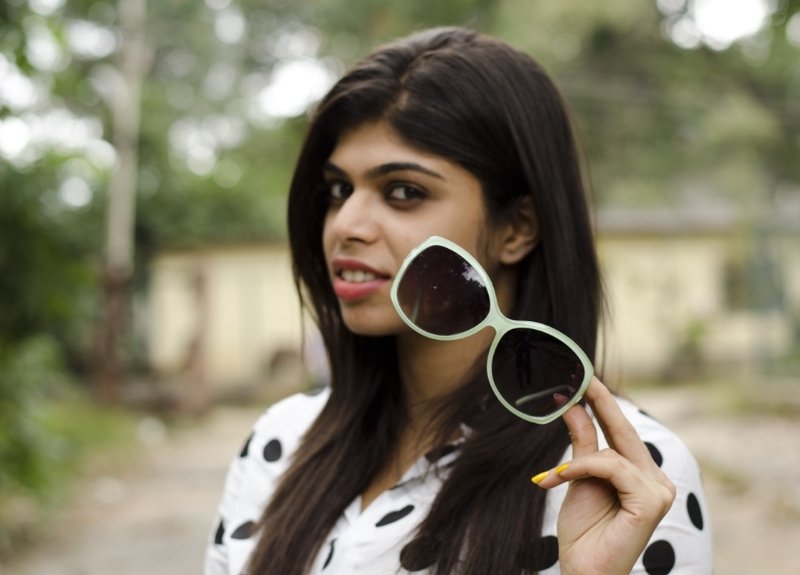 I love your style and your blog.... and I am also from Bangalore. Waiting for the post !! Custom Made for Stilettos Diary.